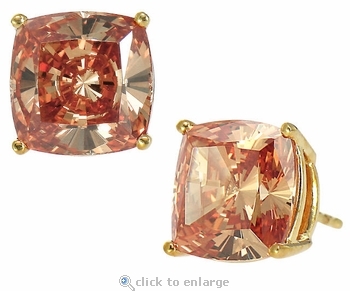 Our 4 Carat Each Cushion Cut Cubic Zirconia Simulated Cognac Diamond Stud Earrings have a rich cognac color similar to chocolate diamonds, champagne diamonds or brown colored diamonds. 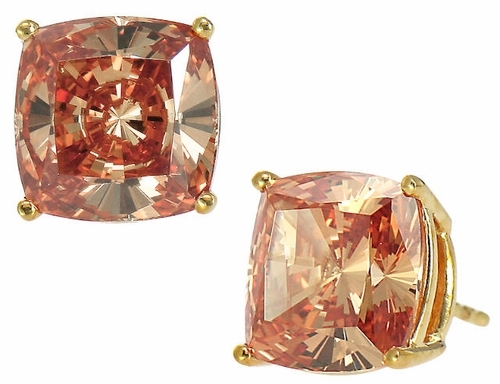 The cushion cut shape in the cognac color take this stone to a whole another level. The 104 sparkling facets are expertly hand cut and hand polished to exact diamond specifications for the best possible diamond alternative. Enjoy the look of style and sophistication when wearing these delectable 4 carat each 9x9mm cushion cut cognac studs set in a lush 14k yellow gold basket setting. The classic basket setting allows for light to be distributed through the cushion cut stone. These earrings are sure to sparkle and brighten any set of eyes who dare to stare! These stud earrings come standard with 14k yellow gold standard push backs and we also have large backs available, which are highly recommended, please see the pull down menu for options.